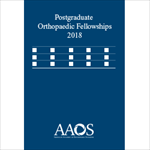 Divided into 11 subspecialty groups, this directory lists over 400 fellowship opportunities. Each listing includes director's name, address, and phone and fax numbers; participating hospitals; stipend; and the goals and characteristics of the fellowship; ACGME accreditation and match program participation. Your order includes unlimited access to the complete, continually updated directory online.